Before a patient is seen for dental implant surgery, there is a lot of preparation that goes into the placement of dental implants. If you suffer from missing teeth and are considering implants, 3D Cone Beam Technology can be of assistance to you. This technology helps to diagnose ailments, develop treatment plans, minimize pain, and accelerate healing of implant surgery and many other procedures. 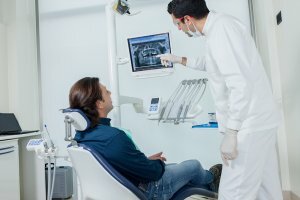 3D Cone Beam Technology produces a clear 3D image, which allows your us to view the condition of your mouth and identify any potential problem areas. It provides a quick assessment of your specific dental needs, while exposing you to less radiation than average dental x-rays. When considering implant surgery, it is important to place the implants precisely. 3D Cone Beam technology allows us to accurately pinpoint the location of your implant placement. This diminishes the margin of error. By establishing a clear plan for your procedure, it allows for an expedited time frame for the implant surgery to be completed and a higher chance of success. The images produced clearly display your teeth, but also provide us accurate information about the location of your nerve endings. This creates precise accuracy and care to avoid these nerves and minimize the discomfort experienced during and after a procedure. Because the image is an exact map of your teeth, bones, and nerve endings, this allows for to perform implant placement with greater accuracy, assisting in faster recovery times. 3D Cone Beam Technology allows us to accurately assess your needs, creating a customized plan for your dental implants. This ultimately means less pain and faster healing from oral procedures. To learn more about 3D Cone Beam Technology, contact Prestige Oral Surgery today at 732-297-7000.